The “Vibrosaun Machine” simulates the effect of exercise in a reclining position. A therapeutic dry sauna consisting of a padded vibrating bed, & dry heat which circulates through the unit over & under the bed. Whilst cold air keeps your head & face cool, the rest of the body is inside the machine. The unique combination of heat and vibration increase the heart and pulse rates, accelerating blood flow and the intake of oxygen to burn up carbohydrates, such as starches, then fat cells. Your circulation will increase, fluid retention relieved, blood pressure lowered, relieved muscle aches & pains, greatly relieving tension & stress, you will be left rejuvenated & on your way to a healthier body full of vitality and total well-being for body, mind, soul. The combination of heat and vibration assists with weight loss, back pain treatment, arthritis treatment, weight loss, detox and cleanses and fibromyalgia. Massage therapy and sauna are both indicated as having beneficial effects on back pain and helping with back pain management. 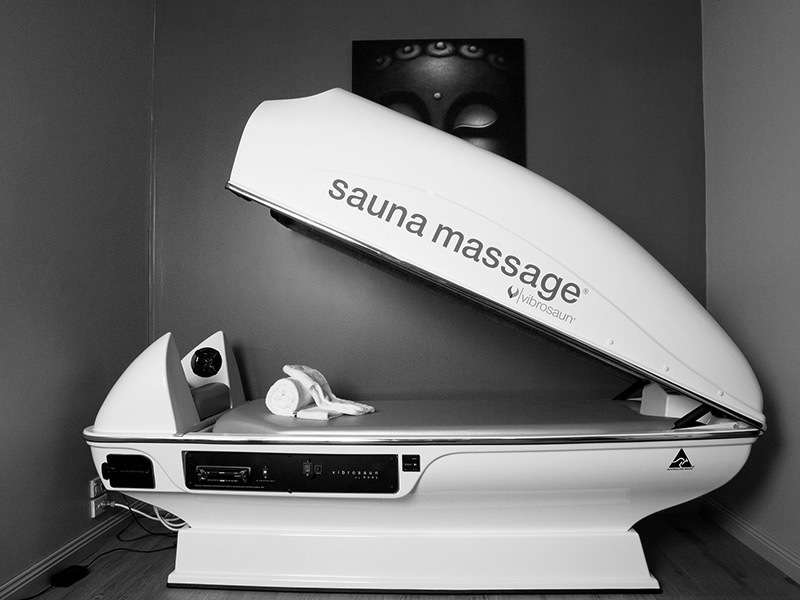 The Vibrosaun Sauna Massage combines both treatments to deliver safe back pain treatment. The warm environment of Vibrosaun is ideal for accelerated healing and providing general and lower back pain relief. The vibration coupled with heat relaxes the muscles, and allowing improves blood flow to circulate unobstructed throughout the entire spinal column. Warmer environments, increased circulation and keeping the body in good health can help drastically minimise the impact arthritis has on your quality of life. The combination of heat and massage therapy in the Vibrosaun makes it a perfect arthritis treatment for ongoing management of pain and mobility. The vibrating massage therapy gently relaxes muscles and simulates movement, contributing in a minor way to burning calories. Then, as the dry sauna heat is introduced and the body temperature increases, blood vessels dilate and increases circulation and of course, the heart and pulse rate, all of which aids weight loss through toxin release and increased wellbeing and muscle and joint movement. Our lymphatic system, kidneys, and liver are responsible for cleansing the body and removing impurities and toxins from the system. Regardless of weight, chemicals and toxins build up in the body, but when a body gets overloaded with toxins, weight gain is often one of the side-effects. In modern life, it is impossible to avoid toxic loading, so taking time to detox cleanse will reap long-term health benefits.